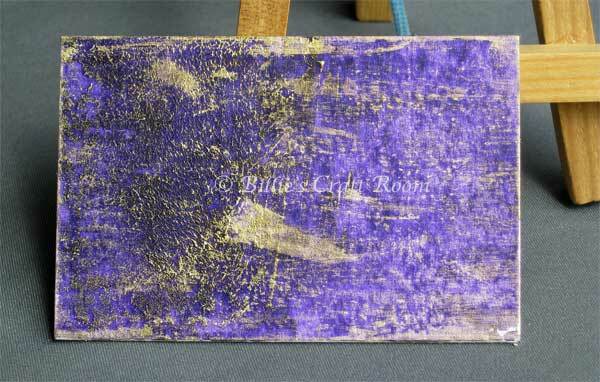 Apply a layer of Winsor Violet to the mount board using the palette knife. Allow this layer to dry before you move on. For a darker finish apply a second layer of Winsor Violet to the mount-board. If you apply the paint generously, you can also dab the flat of the knife into the paint to create additional texture. Allow this layer to dry fully before you move on. Put some Gold Interference colour onto the plate. Pick up some of this colour using the rag. Dab off the excess paint on to a clean area of the paint. You only want a small amount on the cloth. Swipe the rag over the board, just catching the top surface. The colour will catch on areas of texture and highlight them. While you get used to the technique, start on the sides of the board and work inwards, if you have too much paint on the cloth you will get a different effect! By starting at the edges of the board and working inwards, the excess paint will be worked off a little on the sides of the board. Vary how you apply the paint, for different effects. Use varying amounts of paint at each stage and experiment to discover an effect that you like. Try applying the Shimmering gold over other dark colours of card or paint to find more colour combinations you like. I hope you enjoyed this tutorial, do let me know what you think and I’d love to see your experiments with this technique.